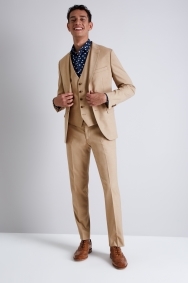 This suit by Moss London has a classic feel thanks to its cappuccino fabric, but it’s cut in a sharp skinny fit to form a contemporary silhouette. It’s a fashionable look that will see you making a statement at work or events. 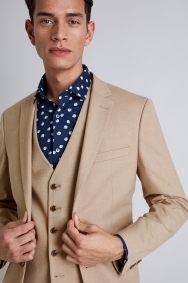 Notch lapels and a two-button fastening keep the outfit simple, and the jacket is fully lined to hold its shape wear after wear. 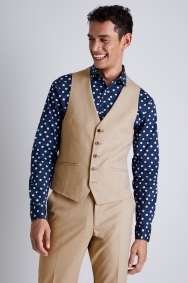 Go for the full 3-piece suit whenever impressing is on the cards, and add a playful punch with a patterned shirt in a deep colour to offset the cappuccino. 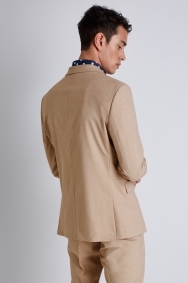 Sizing was perfect with lovely details inside the blazer. Absolutely perfect fit. Ordered online for my engagement ceremony and it’s exactly the colour I wanted to wear. I got many compliments on the day about my suit from family and guests. Great online service and delivery within 2 - 3 working days of placing my order. If you’re ever unsure of your size you can go in-store and get measured before ordering. Took a risk with the colour - definitely something a bit different! Turned out to be a perfect fit, and I grew to like the colour too. Will definitely be taking advantage of the sale again - what a bargain. Good value for money. 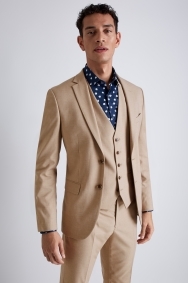 Lovely looking suit. 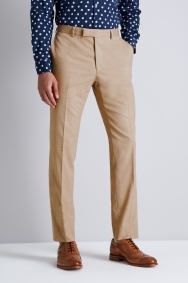 Excellent colour for the summer, my only comment is that the trousers should have come in slim and normal fit.